Bake a sheet cake the size that you need to feed as many people as you are going to have at your birthday party. Ice the cake in cream or ivory colored buttercream icing. Before smoothing the top of the cake add a little bit of light golden brown icing just around the edges of the cake top. Now smooth the top, blending the golden brown edges into the ivory color icing. Use your cake spatula to make sure the surface is nice and smooth. This is going to give an antique looking effect to the cake. I then took a picture with my digital camera of her hospital baby picture and her present day picture and enlarged them to the size that I needed and printed them in Sepia to give them an antique look. I cut them in an oval shape and laminated them on both sides and cut them again leaving a small laminated edge around the entire picture. Next, I laid them on the cake surface spacing them evenly. Use your star tip, size #18 and put a strip of the light golden brown icing down the inside fo the decorating bag and then fill it with the ivory icing. 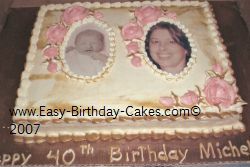 Do a shell border around the two pictures and the top and jbottom edges of the sides of the cake. make a light pink icing and make roses using rose tip, size #125. Place the roses and rose buds around the top and side of each picture. Change the tip on your ivory and light golden brown icing bag to a leaf tipe, size #352 and make the leaves around the pink roses. Change the tip again to a round tip, size #5 and write the message on the cake board.